Certain mutations in the Deadend1 (Dnd1) gene are the most potent modifiers of testicular germ cell tumor (TGCT) susceptibility in mice and rats. In the 129 family of mice, the Dnd1 Ter mutation significantly increases occurrence of TGCT-affected males. To test the hypothesis that he Dnd1 Ter allele is a loss-of-function mutation; we characterized the consequences of a genetically-engineered loss-of-function mutation in mice, and compared these results with those for Dnd1 Ter . We found that intercrossing Dnd1 +/KO heterozygotes to generate a complete loss-of-function led to absence of Dnd1 KO/KO homozygotes and significantly reduced numbers of Dnd1 +/KO heterozygotes. Further crosses showed that Dnd1 Ter partially rescues loss of Dnd1 KO mice. We also found that loss of a single copy of Dnd1 in Dnd1 KO/+ heterozygotes did not affect baseline occurrence of TGCT-affected males and that Dnd1 Ter increased TGCT risk regardless whether the alternative allele was loss-of-function (Dnd1 KO ) or wild-type (Dnd1 + ). Finally, we found that the action of Dnd1 Ter was not limited to testicular cancer, but also significantly increased polyp number and burden in the Apc +/Min model of intestinal polyposis. These results show that Dnd1 is essential for normal allelic inheritance and that Dnd1 Ter has a novel combination of functions that significantly increase risk for both testicular and intestinal cancer. Testicular germ cell tumors (TGCTs) are the most common cancer affecting young men. They are disproportionately represented in men aged 20–40, comprising ~60% of all cancers in this age group , while accounting for only 1.0-1.5 % of all cancers . The incidence of TGCTs has increased in the last 30 years , rising approximately 3% per year from 1972 to 2002  compared to an overall annual decrease of 0.6% from 1994–2009 for all cancers in men . Testicular cancer is widely considered to be one of the most heritable forms of cancer [6, 7]. Genetic factors contribute significantly to TGCT susceptibility as exemplified by a 4- to 15-fold increased risk in the sons and brothers of affected men, respectively [8, 9]. With conventional inheritance however, risk should be similar in sons and brothers. The ~4-fold difference in occurrence of affected sons and brothers implies that other modes of inheritance are involved. Despite strong heritability, known genetic mutations and single nucleotide polymorphisms (SNPs) make only modest contributions to susceptibility, illustrating the genetically complex nature of this disease. The gr/gr deletion, which is a common cause of infertility in men, is associated with increased TGCT risk . But its contribution is modest, occurring in only 3% of TGCT cases with a family history and 1% of unaffected individuals . gr/gr results from a 1.6 Mb deletion at the AZFc locus at Yq11 of the human Y chromosome, a region that contains multiple copies of several genes that are involved in male germ cell development including DAZ (deleted in azospermia), BPY2 (basic charge, Y-linked 2) and CDY1 (chromodomain protein, Y-linked 1). Effects of the gr/gr deletion on germ cell development and differentiation are largely unknown. Several single nucleotide polymorphisms (SNPs) are associated with increased TGCT risk in humans. In particular, six studies implicate SNPs that are associated with at least 14 genes: ATF7IP , BAK1, DMRT1, KITLG, SPRY4, TERT, HPGDS, MAD1L1, RFWD3, TEX14, RAD51C, PPM1E, DAZL and PRDM14[12–19]. Molecular mechanisms remain unclear, in part because many SNPs are located outside the coding region of the associated gene, and in part because the haplotype structure and sequence of these loci have not yet been fully reported. Interestingly, the TERT SNP is also associated with adenocarcinoma . Certain mutations in the Dead End 1 (Dnd1) gene are potent modifiers of TGCT susceptibility in both mice and rats. In the mouse, the spontaneous Dnd1 Ter mutation significantly increases TGCT susceptibility in the 129 family of inbred mouse strains. In particular, Dnd1 Ter increases occurrence of TGCT-affected males from a baseline of ~5% in the 129S1/SvImJ strain to 17% in Dnd1 +/Ter heterozygotes and 94% in Dnd1 Ter/Ter homozygotes [21, 22]. The Ter mutation is a single base substitution in exon 3, 3′ to its single RNA recognition motif (RRM), that transforms an arginine residue to a premature stop codon (Figure 1, see also ). The Ter mutation has been proposed to produce an mRNA that is lost by nonsense-mediated degradation owing to the presence of the premature stop codon. This conclusion was based on northern blots of mRNA isolated from TGCTs in Dnd1 Ter/Ter males . But the tissue type (TGCTs) used in this study may not have been appropriate to assess the fate of Dnd1transcripts. In the rat, a spontaneous mutation has been identified where a G to A substitution in exon 4 produces a premature stop codon that is thought to result in a 62 amino acid truncation at the C-terminus of the DND1 protein (Figure 1, see also ). This mutation leads to germ cell tumors in males and females as well as to spontaneous metastases. In humans, sequencing of TGCT candidate genes in several large studies failed to detect a significant number of DND1 mutations [4, 24]. Of the two SNPs that were identified, one (Glu86Ala) is located within the conserved RRM of DND1 (Glu86Ala). The functional consequences of this mutation on Dnd1 expression and function or on TGCT risk are not known. Structure of the Dnd1 , Dnd1 Ter and Dnd1 KO genes and their inferred predicted protein products. Gene arrangements are displayed above the solid line, and the corresponding protein product is displayed below the solid line. Dnd1 has two isoforms: α-Dnd1 and β-Dnd1 which differ in the amino-terminus of the protein. Dnd1 has an RNA recognition motif (RRM) in the C-terminal portion of exon 3. The HRAAAMA motif that is presumably part of the putative ATPase domain is located between amino acids 181–186 in the mouse genome. SNPs identified in human TGCTs include a (1) Glu86Ala  and (2) an Asp219Glu . In the mouse, the Ter mutation creates a premature stop-codon at amino acid 178 (★3), which is located 37 nucleotides from the 3′ most exon-exon junction. The rat Ter mutation has the premature stop codon at amino acid 289 (★4) within exon 4. The RRM is intact in both mouse and rat Dnd1 mutants allowing these proteins to possibly recognize and bind to target RNAs; the putative ATPase domain is lost in the mouse Dnd1 Ter and truncated in rat Dnd1 Ter . The Dnd1 KO allele retains the 3′ most portion of exon 3 and exon 4, but does not have a transcriptional start site. Dnd1 has many unique functions. Dnd1 shares significant sequence similarity with A1cf, a gene that encodes the RNA binding subunit of the Apobec1 cytidine deaminase that edits specific sites in specific mRNAs . Interestingly, DND1 blocks access of specific miRNAs to their 3′ target in mRNAs such as p27, LATS2 and TDRD7. DND1 also binds several pluripotency factor mRNAs including Oct4, Sox2, Nanog and LIN28 , regulators of cell cycle including LATS2, TP53, p21 and p27[27, 28], apoptotic factors such as BCLX and BAX , and is a positive regulator of geminin mRNA translation through binding to its 3′ UTR . The role of DND1 in these functions and complexes is unknown. DND1 transports mRNA transcripts from germ cell nuclei to germ cell granules . Finally, Dnd1 is required for primordial germ cell (PGC) survival ; PGCs are the stem cell for TGCTs . Together these observations implicate Dnd1 in many aspects of RNA translation control. The Dnd1 gene in mouse has four exons and encodes an α-isoform, which is 352 amino acids, and a β-isoform, which is 340 amino acids (Figure 1). These isoforms are derived through alternative splicing and differ by 12 amino acids at the amino-terminus of the protein. DND1-α is expressed in early embryos, whereas DND1-β is expressed in the germ cells of the adult testis . Both isoforms contain a single RNA recognition motif (RRM) and a highly conserved HRAAAMA motif (unpubl). This 7 amino acid motif is found in most orthologues of Dnd1 and A1cf (JHN, unpubl.). In zebrafish, ATPase activity has been attributed to a variant of this motif in Dnd1. Several considerations suggest that the assumption that Dnd1 Ter leads to loss-of-function is erroneous. In vivo loss of function using morpholinos to reduce expression in zebrafish showed that Dnd1 is required for PGC survival , possibly through an ATPase activity . Although TGCTs have been reported in zebrafish [35–37], reduced Dnd1 expression was not sufficient for tumorigenesis. However, because genetic background strongly regulates TGCT susceptibility in mice and rats [23, 38–40], absence of TGCTs in the zebrafish study could implicate either the nature of the mutation or genetic background as critical elements determining tumorigenic outcome. To test whether TGCT susceptibility depends on the nature of Dnd1 mutations, we generated a line of 129/SvImJ-Dnd KO mice. We found that deficiency of Dnd1 leads to highly biased allelic inheritance and that Dnd1 Ter partially restores normal inheritance. We also found that Dnd1 Ter acts distinctly from Dnd1 KO to increase TGCT risk in a dosage-dependent manner in 129S1/SvImJ males, whereas Dnd1 KO did not significantly affect susceptibility. Finally, recent work suggests that susceptibility to both TGCTs and intestinal polyposis share genetic predisposition  and that DND1 is normally expressed in the intestine [42–46]. We therefore tested whether Dnd1 Ter affects intestinal tumorigenesis and found that Dnd1 Ter significantly increases polyp number and burden in Apc +/Min mice. Unexpected results were found for Dnd1 +/KO intercrosses that were intended to produce Dnd1 +/KO heterozygotes and Dnd1 KO/KO homozygotes as well as Dnd1 +/+ wild-type controls for TGCT surveys. The genotypic distribution among adult mice differed significantly from 1:2:1 Mendelian expectations (Table 1; χ2 = 108.4, p<0.0001; two-tailed test, 2 degrees of freedom). In particular, no Dnd1 KO/KO homozygotes were observed among 282 offspring (Table 1). To assess the extent of the deviation from expectations, we assumed that the number of Dnd1 +/+ mice (N = 120) corresponded to expectations, and then extrapolated from this wild-type number to the expected numbers of Dnd1 +/KO heterozygotes (N = 240) and Dnd1 KO/KO homozygotes (N = 120) mice. In addition to a complete deficiency of Dnd1 KO/KO homozygotes, only 68% (= 162/240) of the expected number of Dnd1 +/KO heterozygotes was found, suggesting that parental Dnd1 +/KO heterozygosity either biased segregation against the Dnd1 KO allele, or alternatively that partial or complete loss of Dnd1 function led to lethality for Dnd1 KO/KO homozygotes and reduced viability for Dnd1 +/KO heterozygotes. Dnd1 KO segregation in intercrosses and backcrosses. Results are presented after pooling data for both genders (Tables 1, 2, 3, 4), because occurrence of females and males did not differ significantly (not shown). To examine the developmental timing of genotypic loss, we time-mated heterozygous Dnd1 +/KO males and females, and flushed embryonic day 3.5 (E3.5) embryos from the oviduct. Embryos (N=25) were individually cultured for one week before genotyping. The genotypic distribution differed significantly from 1:2:1 Mendelian expectations (Table 2; χ2 = 22.4, p<0.0001; two-tailed test, 2 degrees of freedom). No Dnd1 KO/KO homozygotes were found among 25 cultured embryos, the number of Dnd1 +/KO heterozygotes was significantly reduced, and no evidence was found for unfertilized oocytes. In addition, the genotypic distributions for E3.5 embryos (Table 2) and for adult mice (Table 1) did not differ significantly (not shown). These results confirm observations found among adult mice and suggests that reduced Dnd1 function either biased segregation, or led to early embryonic lethality. Interestingly, unusual inheritance patterns have also been reported for Apobec1 KO – Dnd1 Ter interactions tests  and for Apobec1 complementation factor A1cf, the paralog of Dnd1. To test whether allelic segregation in Dnd1 +/KO is inherently biased, we examined the genotypic representation in reciprocal backcrosses of Dnd1 +/KO heterozygotes to Dnd1 +/+ wild-type mice. Segregation did not differ significantly from 1:1 Mendelian expectations for either maternal or paternal heterozygosity (Table 3). Interestingly, occurrence of Dnd1 +/KO heterozygous progeny differed in intercrosses versus backcrosses of Dnd1 +/KO heterozygous parents, where a significant deficiency of Dnd1 +/KO heterozygotes was found among intercross but not backcross progeny (Table 3). These results suggest that segregation in each parent is normal and that gametes in each parent are comparably functional in backcrosses but not intercrosses. *Mendelian expectations based on Dnd1 +/+ ; litter size (mean ± SEM, n is the number of litters). Litter size can be used to determine whether unusual inheritance patterns result from embryonic lethality. Litter size should be reduced substantially if deficiency of some genotypes results from lethality. By contrast, if production of gametes or fertilization is biased towards particular alleles, litter sizes should not differ among the various crosses. However, despite significant deviation from the expected genotypic distributions (Table 1), litter sizes did not vary significantly among crosses (Table 3). These results argue against lethality as the cause of the unusual genotypic distributions. Based on the premise that the DND1Ter protein is translated instead of being lost through nonsense mediated degradation, a single copy of Dnd1 Ter may be sufficient to at least partially rescue Dnd1 KO/KO loss. To test this hypothesis, we intercrossed mice heterozygous for the Dnd1 KO and Dnd1 Ter mutations and examined occurrence of the four genotypic classes among the resulting offspring (Table 4). The distribution of Dnd1 +/+ , Dnd1 +/KO , Dnd1+/Ter, Dnd1 KO/Ter offspring differed significantly from 1:1:1:1 Mendelian expectations (χ 2 = 9.1, p<0.03; two-tailed test, 3 degrees of freedom). The genotype with the largest deviation from expectations was the Dnd1 KO/Ter heterozygote, which supports the hypothesis that the DND1Ter protein is translated and retains sufficient functionality to enable at least partial viability of animals in the absence of wild-type DND1; if Dnd1 Ter conferred loss of function, then loss of both Dnd1 KO/KO and Dnd1 KO/Ter should have been found. Male progeny (N=130) from crosses between Dnd1 +/Ter and Dnd1 +/KO mice. To determine whether the Dnd1 KO allele leads to reduction of Dnd1 mRNA, Dnd1 transcript levels were measured in heart and testis from Dnd1 +/KO and wild-type littermate control males that were 6–8 weeks old. 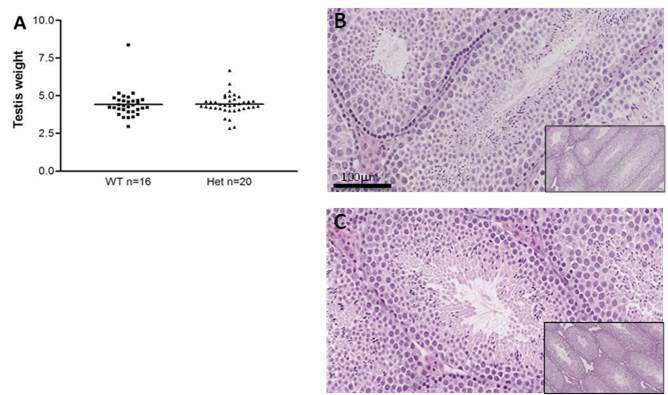 Dnd1 +/KO mRNA levels were significantly reduced in heart (0.41 ± 0.12; t = 3.1, p<0.05; two-tailed t-test, n=7) and substantially reduced in testis (0.56 ± 0.19; n=7) compared to their wild-type littermate controls (1.0 ± 0.06 and 1.0 ± 0.26; n=3 and 7, respectively) (Figure 2). Dnd1 mRNA levels from Dnd1 Ter/Ter hearts (1.33 ± 0.26) did not differ significantly from wild-type controls. Testis samples were not tested because severe germ cell deficiency in Dnd1 Ter/Ter males would compromise interpretation of any results [21, 22, 36]. These results confirm that Dnd1 KO but not Dnd1 Ter mice showed reduced Dnd1 mRNA levels. 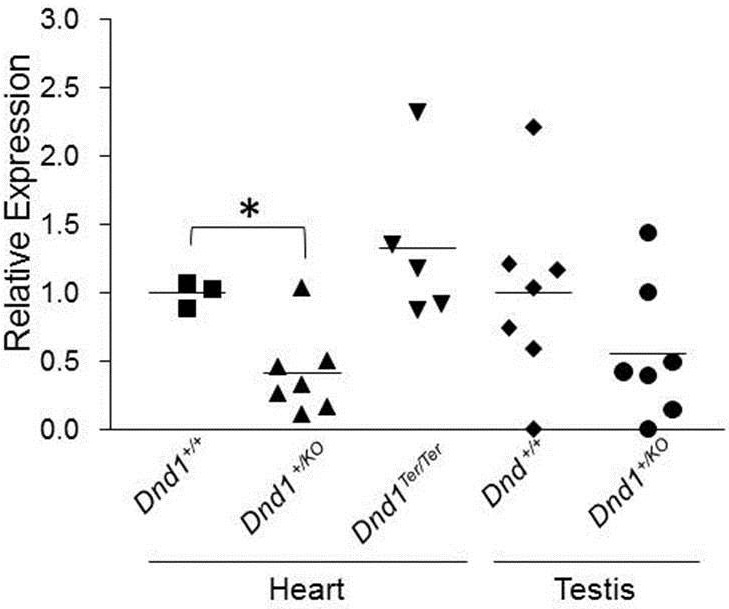 Dnd1 RNA levels in heart and testes. Dnd1 expression cannot be measured reliably in Dnd1 Ter/Ter testes because they deficient in germ cells. We next sought to test whether Dnd1 Ter and Dnd1 KO alleles induce similar effects on PGC numbers in testes of heterozygous and wild-type littermates from the Dnd1 KO line. Testes from Dnd1 +/Ter males showed modest but significant reductions in germ cell numbers and testis weight [22, 49]. We weighed testes from 6–10 week old Dnd1 +/KO males and their wild-type (+/+) littermates to determine if they were phenotypically similar to those from Dnd1 +/Ter . Testes from wild-type males weighed an average of 4.43 ± 0.88g, which was similar to the average testes weight of 4.44 ± 0.69g in Dnd1 +/KO heterozygotes (Additional file 1: Figure S1A). These results suggest that germ cell numbers were not significantly reduced in Dnd1 +/KO males. Histological analysis confirmed these results for both Dnd1 +/Ter and Dnd1 +/KO males (Additional file 1: Figure S1B & C). Finally, both male and female heterozygotes for the Dnd1 KO allele were fertile as measured by the similar number of offspring produced in backcrosses to 129S1/SvImJ (Table 3). Together these results suggest that the Dnd1 KO allele did not negatively impact germ cell numbers or fertility. To test whether partial Dnd1 deficiency affects occurrence of affected males, Dnd1 +/KO and their Dnd1 +/+ wild-type control littermates derived from Dnd1 +/KO intercrosses were surveyed for spontaneous TGCTs (Table 5). Significant differences were not detected for occurrence of TGCT-affected Dnd1 +/KO heterozygous and Dnd1 +/+ wild-type males. By contrast, 39% of Dnd1 +/Ter males are affected, which is significantly higher than the occurrence of affected Dnd1 +/KO and their Dnd1 +/+ males (p<0.0001; Fisher’s exact test, two-tailed, 1 degree of freedom). (This rate for Dnd1 +/Ter males in our colony is significantly higher than published reports . The rate has been consistently higher for several years, without obvious explanation. Because of the study design, this increased rate does not affect results or interpretation in the present work.) Thus, the Dnd1 Ter but not the Dnd1 KO mutation increases TGCT risk. Dnd1 +/KO males are offspring of both Dnd1 +/+ × Dnd1 +/KO and Dnd1 +/KO × Dnd1 +/+ reciprocal crosses. ǂ Results from Zechel et al..
To test whether the increased occurrence of affected Dnd1 Ter/Ter males was a result of increased Dnd1 +/Ter or the absence of Dnd1 +/KO , we crossed Dnd1 +/Ter and Dnd1 +/KO animals to generate compound heterozygous Dnd1 Ter/KO offspring that were surveyed for TGCTs (Table 6). A single copy of Dnd1 Ter increased occurrence of TGCT-affected males from a baseline of 15% for Dnd1 +/+ wild-type males to 39% for Dnd1 +/Ter males. A second copy of Dnd1 Ter (Dnd1 Ter/Ter ) further increased occurrence of affected males to 98% [21, 22]. We then asked whether the higher occurrence of affected Dnd1 Ter/Ter males was due to the absence of wild-type DND1, or a result of an increased dosage of Dnd1 Ter . Compound heterozygous males (Dnd1 KO/Ter ) have a rate that does not recapitulate the rate found for Dnd1 Ter/Ter homozygotes (35% versus 97.8%, respectively) (Table 6). Instead, the rate for compound heterozygotes was similar to the rate (34% and 39%) Dnd1 +/Ter heterozygote. These results suggest that DND1Ter protein has dose-dependent effects on TGCT risk. Dnd1 +/KO and Dnd1 +/Ter animals were intercrossed to test for occurrence of males with at least one TGCT. ǂ Offspring from Dnd1 +/KO × Dnd1 +/Ter crosses; * offspring from Dnd1 +/Ter × Dnd1 +/Ter . ǂData are from Zechel et al.. Although Dnd1 Ter is a potent modifier of TGCT susceptibility, we speculated that the tumorigenic properties of Dnd1 Ter may also be relevant in the intestine where Dnd1 is also expressed . To test this hypothesis, we used the Apc +/Min mouse model of intestinal polyposis. These mice develop numerous intestinal polyps at an early age and are a model of human Familial Adenomatous Polyposis (FAP) . We crossed Dnd1 +/Ter and Apc +/Min mice to generate compound Apc +/Min Dnd1 +/Ter heterozygotes (test) as well as a single-heterozygous Apc +/Min Dnd1 +/+ control. After 100 days of age, a significant 1.5-fold increase in polyp number was observed in Apc +/Min Dnd1 +/Ter double-heterozygous test males compared to Apc +/Min Dnd1 +/+ control males (130 ± 1.3 and 96.2 ± 1.4, respectively; t = 4.4, p<0.001, two-tailed t-test; Figure 3A). Similarly, total polyp mass was also significantly elevated from 192.2 ± 11.6 mm2 in Apc +/Min Dnd1 +/+ mice to 352.6 ± 11.4 mm2 in Apc +/Min : Dnd1 +/Ter males (t = 4.5, p<0.0001; two-tailed t-test; Figure 3B), suggesting that a single copy of Dnd1 Ter exacerbates intestinal polyp initiation and development in mice that are genetically susceptible to intestinal polyposis and that the action of Dnd1 Ter is not limited to TGCTs. Polyp number (A) and mass (B) in C57BL/6- Apc +/Min Dnd1 +/ Ter males. Males were surveyed for polyp number and mass after 100 days on the 5010 diet. TGCTs are the third most heritable form of cancer, with approximately 25% of the susceptibility being attributed to underlying genetic factors . The limited success in identifying genetic variants that account for a significant proportion of TGCT cases highlights the complex nature of TGCT susceptibility [54–56]. Discovery of the gr/gr deletion, together with validated SNPs in the ATF7IP , BAK1, DMRT1, KITLG, SPRY4, TERT, HPGDS, MAD1L1, RFWD3, TEX14, RAD51C, PPM1E, DAZL and PRDM14[12–19, 57]. Even with these findings however, the majority of inherited TGCT susceptibility remains unknown. In the mouse, several TGCT susceptibility genes have been identified, including Kit, Kitlg, Pten, Dmrt1, Eif2s2 and others (for a review, see ). Together these human and mouse genes implicate pathways and functions related to germ cell proliferation, PGC differentiation and cell cycle control in TGCT development. But much remains to be learned about the nature of mutations in these genes that lead to tumorigenesis and about the ways that these molecular changes disrupt these pathways. The current study suggests that Dnd1 Ter is not a loss-of-function allele, but instead affects TGCT risk and embryonic development in distinct ways from Dnd1 KO , a true loss-of-function mutation. The location of the point mutation found within Dnd1 does not conform to the “position of an exon-exon junction rule” for non-sense mediated decay . The premature Ter stop codon is located 37 nucleotides upstream of the 3′-most exon-exon junction, within the 50–55 nucleotide range that fails to elicit nonsense-mediated decay (Figure 1). 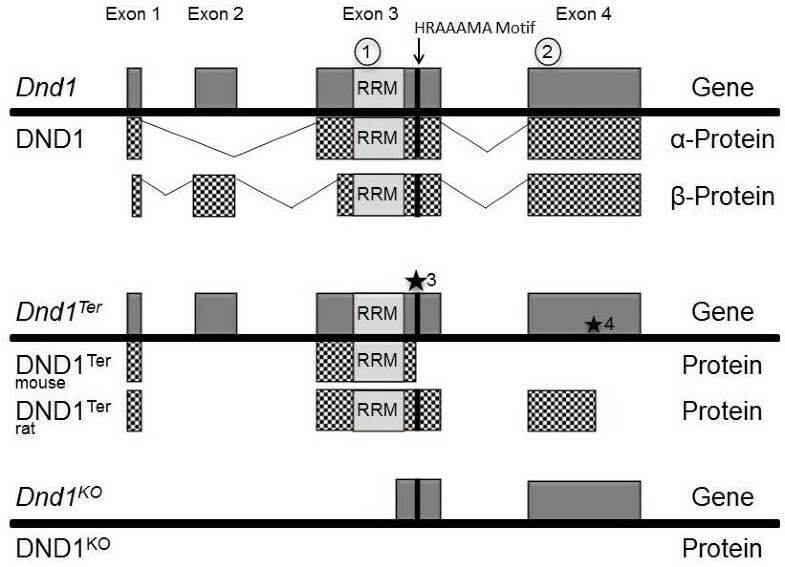 As a result, a translated DND1Ter protein could be created consisting of Dnd1 exons 1–2 and part of exon 3, with an intact RRM but a disrupted HRAAAMA. The RRM within DND1Ter may still recognize its target mRNAs, but any functional or regulatory capabilities normally derived from the deleted portion of DND1 would be absent. This supposition is supported by work with the rat DND1Ter mutation, where the GFP-DND1Ter fusion protein is detectable in Huh7 cells . The normal cellular processes that DND1Ter might disrupt are numerous because RNA binding proteins have diverse functions, including alternative splicing, RNA stability, miRNA regulation, and translation control [60–63]. To date, antibodies are not available for mouse DND1, thereby precluding many obvious studies. Recent work revealed an essential role of a putative ATPase domain in DND1 (RAAAE) in PGC survival . This previously unannotated domain shares homology with RAAA (amino acids 178–181) in mouse DND1 where the arginine residue represents the amino acid substituted with a stop codon in Dnd1 Ter . Thus any ATPase activity in mouse DND1 possesses would be lost in DND1Ter. This region is also part of a larger motif in DND1, HRAAAMA, which is highly conserved and found in many paralogous RNA binding proteins, including Apobec complementation factor (A1CF), suggesting that this motif is functionally important in this gene family (unpubl.). Although DND1Ter appears to be a novel variant that increases TGCT risk, its tumorigenic effects are limited to the 129 strain of mice, which is not surprising, since this is the mouse strain that is susceptible to spontaneous TGCTs [38, 63]. This finding highlights the importance of genetic background on TGCT susceptibility, which has been observed in humans, particularly in the disparate TGCT rates among ethnic groups [4, 64]. The importance of genetic background is also evident in the interaction of DND1Ter and mouse background. The 129 strain interacts positively with DND1Ter to increase TGCT risk, whereas C56BL/6J and other strains only exhibit phenotypes related to some but not all aspects of mutations in genes such as Kit, Kitl, Pten, Eif2s2I and other TGCT modifier genes, but not TGCTs [55, 65, 66]. However, the tumorigenic effects of Dnd1 Ter are not limited to PGC transformation in the 129 strain mice. C57BL/6J mice with the Apc Min mutation are highly susceptible to intestinal polyps . However, when mice are compound heterozygotes for both Apc Min and Dnd1 Ter , polyp numbers and polyp burden are significantly increased (Figure 3). These results suggest that DND1Ter affects pathways in both PGC transformation and intestinal polyposis. The contrasting effects of different classes of Dnd1 mutations may explain why sequencing studies failed to yield mutations within DND1 in human TGCT cases [24, 25]. Complete loss of DND1 function is not sufficient to promote TGCT formation, even on the TGCT-susceptible 129S1/SvImJ inbred genetic background; reducing the chances that DND1 mutations play a significant role in human TGCTs. Results from zebrafish support this interpretation. Loss of Dnd1 inhibits PGC migration and results in PGC deficiency, but did not produce TGCTs . TGCTs have been previously reported in zebrafish [35, 49]. Dnd1 Ter homozygotes also show reduced migration and loss of PGCs, with typically less than 20 PGCs arriving to the presumptive fetal gonads . Instead, our results show that it is the loss of the carboxy-terminus of DND1 protein that increases TGCT risk. The role of DND1Ter in TGCT formation is further supported by recent results in a rat study where a spontaneous mutation producing a premature stop codon in exon 4, similar to DND1 Ter , resulted in TGCTs . To date, human DND1 mutations have not yet been reported that yield a similarly truncated DND1 protein. Through intercrosses with mice carrying a complete loss of function Dnd1 KO allele our study showed that DND1 is necessary for embryonic viability and results in abnormal allelic segregation. We have further shown that Dnd1 Ter , previously believed to be a loss-of-function allele, is likely translated into a protein that retains some normal DND1 function. Crosses with the Dnd1 knockout and Ter alleles revealed that the effects of the Ter allele on TGCT incidence depend on Ter dosage. Expression of the Ter allele in an APC Min model of intestinal polyposis also significantly increased polyp burden. These results demonstrate that Dnd1 Ter enhances tumorigenesis in two separate mouse models of cancer. This strain (JR002448, previously known as 129/SvImJ) was obtained from the Jackson Laboratory (Bar Harbor, ME, USA). All studies were conducted on this inbred genetic background. ES cells with a targeted deletion of Dnd1 were generated from 129S6 mice by the Intrexon Corporation, (Blacksburg, VA). Exons 1–2 and most of exon 3 of Dnd1 were removed through homologous recombination (Additional file 2: Figure S2), and cells were negatively selected with thymidine kinase (TK) and diphtheria toxin A (DTA), and positively selected with neomycin. PCR was used to confirm homologous recombination in these cells. ES cells were then injected into blastocysts (Case Transgenic and Targeting Facility) and the resulting chimeras were backcrossed onto the 129S1/SvImJ strain for more than 10 generations. C57BL/6J (B6; JR000664) and C57BL/6J-Apc +/Min (Apc +/Min ; JR002020) mice were purchased from the Jackson Laboratory (Bar Harbor, ME). From birth to 30 days of age, all mice were fed an autoclaved standard laboratory diet (Purina 5010 LabDiet (Richmond, IN) and were provided autoclaved water ad libitum. All mice were maintained on a 12-h light/dark cycle at the Wolstein Research Facility (CWRU). Procedures were approved and conducted in compliance with Institutional Animal Care and Use Committee (IACUC) standards at (CWRU). DNA for PCR genotyping was extracted from tail tissue (mice) or cell masses (E3.5 embryo cultures). The nucleotide substitution in the Ter mutation results in the creation of a Dde1 site that was used for genotyping . The Dnd1 KO allele was amplified using primers extending from exon 4 of Dnd1 into the neomycin gene of the targeting construct. The Dnd1 KO primers are: CTGCGTGTTCGAATTCGCCAATGA (F), ACAAAGAGAAACCCGGTCTCGGAA (R). Primers used for genotyping Apc +/Min were previously described . Male mice between the ages of 4–16 weeks were surveyed for TGCTs. Tumor incidence was calculated as the percentage of males with at least one TGCT. Histological analysis (H&E staining, see below) was used to confirm any TGCTs that were ambiguous at autopsy. Mice were euthanized with cervical dislocation. The small and large intestines were immediately removed, flushed with cold PBS, and cut longitudinally for polyp measurements. Polyps were counted and cross-sectional diameter was measured in the small intestine and colon with a Leica MZ10F Modular Stereomicroscope. Individual polyp size and number were used to calculate a measure of total polyp mass for each mouse, and this measure was used as a surrogate for polyp burden. Testes were fixed with 10% formalin for at least 48h. Tissues were then embedded in paraffin and sectioned (5 μm) at the Case Comprehensive Cancer Center Tissue Procurement and Histology Core facility (TPHC). Hematoxylin and eosin staining was done in the TPHC facility. RNA was extracted from cells and tissues using the RNeasy micro- and mini-kits, respectively (Qiagen Inc., Valencia, CA) according to the manufacturer’s instructions and including an on-column DNAse treatment. RNA was reverse-transcribed using the qScript Synthesis Kit (Quanta BioSciences Inc., Gaithersburg, MD). Changes in relative expression were quantified with the Chromo4 real-time PCR system (MJ Research) and TaqMan primers to Dnd1(Invitrogen #Mm00849348) and normalized to 18S (Invitrogen #4319413E) using manufacturer protocols and reported as mean ± SEM. Data are presented as mean ± SEM. Two-tailed t-tests were used to evaluate results for quantitative PCR and data for both polyp numbers and burden. Chi-square contingency tests were used evaluate differences in occurrence of TGCT-affected males. Standard goodness-of-fit tests were used to evaluate differences between observed and Mendelian expectations for backcross and intercross segregation results. Then, to estimate the extent of loss for particular genotypes, the number of wild-type (+/+) mice (or embryos) was taken as the expected number for this genotypic class, and assuming Mendelian segregation (i.e. 1:2:1), the expected number of mutant heterozygotes and homozygotes was calculated. The difference between these observed and expected numbers was used to estimate the extent of loss for each genotypic class. We thank Sabine Schaefer for her helpful comments on a draft of this paper. NCI grant CA75056 supported this work. JLZ and JHN conceived of the study, JLZ did the work with the exception of the data provided in Figure 3, which was conducted and analyzed by SKD. PJT did the embryo flushes and culturing. JDH assisted with initial transgenic mouse creation, experimental design and intellectual input. JHN assisted with the statistical analysis. JLZ and JHN wrote the original draft with editing done by AL, SKD and JDH. All authors read and approved of the final version.